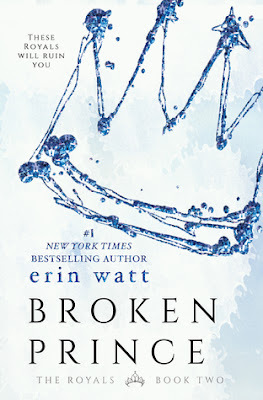 Broken Prince is the amazing second book in the trilogy that is The Royals, by Erin Watt. The first book Paper Princess ended on a cliffhanger and Broken Prince pretty much picked the story up right from that point. We got to find out more about what happened at the end of Paper Princess and the story in Broken Prince just kept getting better and better. It seems like Ella and Reed just cannot stay away from each other at all. Somehow they find themselves drawn towards each other, no matter what happened in the world outside, these two would always find each other. There were more twists and turns in Broken Prince, and we get to read from both Ella's and Reed's POV at the same time, and I really enjoyed that. You get to the end of Broken Prince and bam you get not one but two cliffhangers at the same time! That's a really brilliant (and evil!) way to end a book but I'm fortunate to be able to get straight onto Twisted Palace, the next book in this trilogy, so that I can carry on the story.